I am listening to a talks insider – thinking out and speaking out on why the February 9th Draft Agreement Text unravelled. The DUP unable to deliver. “There was definitely a feeling that we were on the cusp [of a deal],” that talks source told this website, but there was also concern. The latter was well founded. Just five days later on February 14th, this phase of the negotiation was collapsed – the news delivered in a tweet posted on the account of the DUP leader Arlene Foster. On the previous weekend, the mood was much different – a sense that the negotiation was at an advanced stage and close to a deal. “I fear you’re right,” a senior DUP source commented. Why then could it not be delivered? “Because they [the negotiators] weren’t listening,” the source continued. 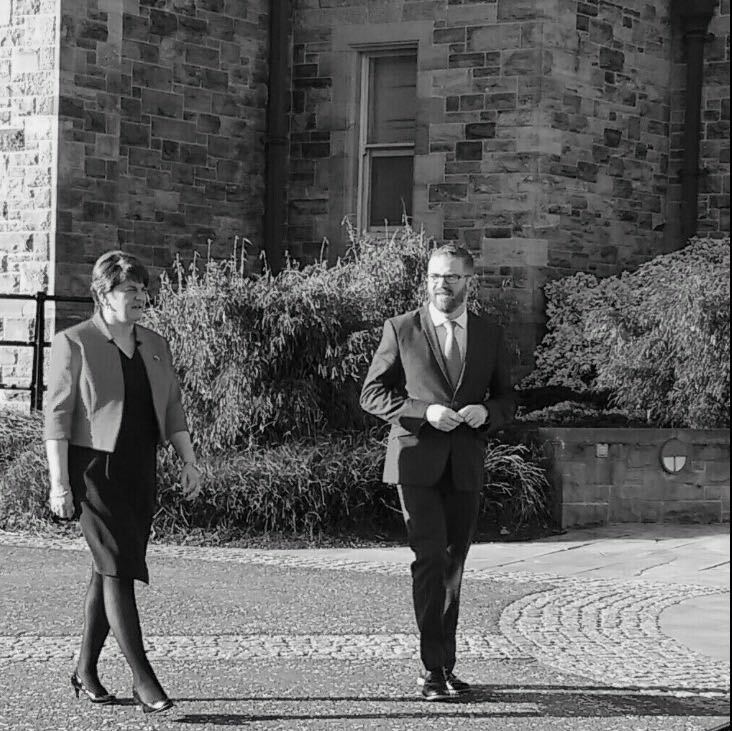 The party Executive meeting on Thursday of this week was given a PowerPoint presentation on the negotiation by Simon Hamilton – as to where it got. He and another of the negotiators Edwin Poots along with Arlene Foster answered questions. This website has been told that there was a question from the floor along the lines of: Are you trying to sell this to us? Any suggestion of such was dismissed. Maurice Morrow, Michelle McIlveen, Nigel Dodds and chief executive Timothy Johnston were at the top table. In recent days the DUP has not been sure footed. In a series of interviews in the period from February 15th through to Thursday the 22nd we have heard the Draft Agreement Text described differently by senior DUP politicians; stretching from just one in a series of documents to the “latest iteration”, but not the final product. The description in correspondence dated February 9th and seen by this website is Draft Agreement Text. Now, another argument has opened out over what was and was not known about a separate negotiation on legacy matters involving Sinn Fein and the NIO. A number of key elements have been outlined. That a consultation would begin on the Stormont House Agreement structure dating back to 2014. This includes the proposed Historical Investigations Unit and Independent Commission on Information Retrieval. That consultation could stretch between 14 & 20 weeks. In the event of an overall agreement, that consultation would not now include a question on the controversial issue of a statute of limitations or amnesty for armed forces. Funding for legacy inquests was to be released over the forthcoming financial year, again in the context of overall agreement. In an interview with Mark Carruthers on The View, Sinn Fein negotiator Gerry Kelly said he could prove the agreement was made, and insisted this separate legacy agreement should go ahead. Another source fears the context of “overall agreement’ could allow the government to “wriggle their way out”. On Friday, Sinn Fein vice president Michelle O’Neill updated the Victims’ Commissioner Judith Thompson on progress made on legacy matters. The DUP has asked the NIO for details. In this fallout over who knew what and who agreed what, might we see another talks paper emerge? The DUP is pushing again for the Executive to be restored and outstanding issues addressed in parallel. So, the next choices are an election or a battle over direct rule versus decision making in a British-Irish intergovernmental conference. There seems little prospect of a renewed DUP/Sinn Fein negotiation and, into the second year of this standoff, there are growing questions about Stormont – about its credibility and worth in this political limbo. The February 9th document – that Draft Agreement Text – was a political compromise. There is no better deal. February 24, 2018 in News & Current Affairs. Under the ‘Law of Diminishing Returns’, it is widely agreed that, there comes a point at which the level of profits or benefits gained is less than the amount of money or energy invested. Surely Karen Bradley can see that DUP and SF are so polarised that they cannot be given joint responsibility for the power sharing Executive. To do so would be irresponsible. Direct Rule is unpalatable but Devolved Government with these jokers unthinkable! “They (the DUP) never prepare their people for political compromise.”? That would indeed be strange, besides being a bit difficult to accept. “Their people” seem to have been rather well prepared for its rejection. I can’t think the DUP is so stupid or indolent as to not do what it is alleged they ought, but have not done, especially in consideration of the possible consequences; They could have done the necessary preparatory work, had they been so minded. But I think they were not. Can they have been engaged in a charade? If so why? Someone who knows and understands Northern Ireland (in a way that I most assuredly do not), and the seemingly peculiar – perhaps absurd – character of its politics, can no doubt explain.